There are no guarantees for safety. As soon as someone offers you a guarantee, someone else sees it as a security challenge to crack. Fortunately there are ways to become more safe. However, if you use the correct tool, you will be so safe that it is too bothersome for nefarious characters to try to crack your security. They'll move on to easier prey. A proper security tool should offer you convenience and strength. We all know that if a tool is too difficult to use, people are going to ignore it, even if it makes them safe. 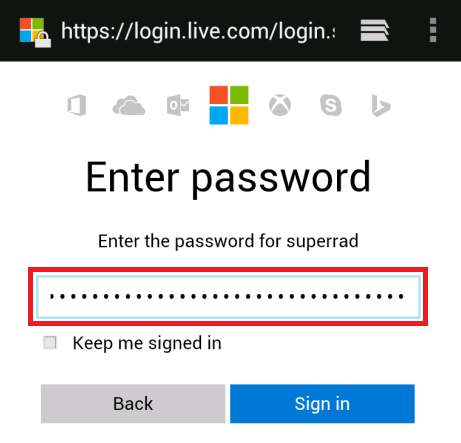 Make it easier to sign in to your secure sites no matter what device you are using. The strong you make your site/keys in C'YaPass, the better. Why would you do all of that? 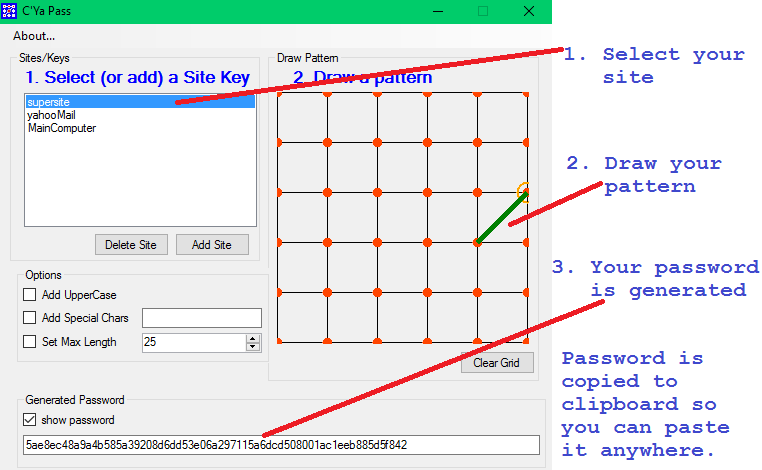 in the extreme case where some hacker comes along and attempts to generate passwords based off of the billions of graphic patterns and unlimited site/key inputs it will make it more difficult for the hacker to get even close to your site/key. Without your exact site key they'll never be able to get your final hash password. Those may be common site/keys which could mean the nefarious actor would be half way towards a final hash. Well, it's probably not even half way with all the graphic patterns she'd have to try also, but stronger is better. Of course, you can make the pattern you draw far more complex than my example also. I reveal everything about C'YaPass so you can be the most secure possible. It we all simply become more conscious of security through many people considering passwords and we obtain stronger security, then I consider that a success. Once you have just one site/key entered into C'YaPass you will begin to realize the benefit of never having to type a password again. It's as simple as three steps shown in the following series of images. Simply click on the item in your list of site/keys. Here's a quick zoomed up look at the generated password. Later we'll compare this to the one that is generated in the Anrdoid app. 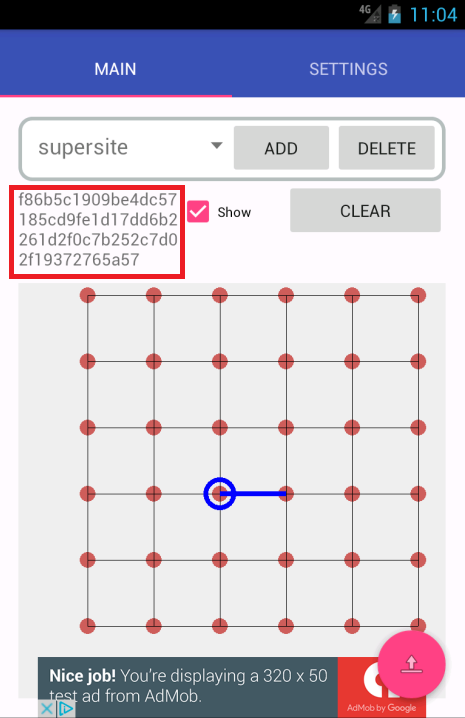 This is your unique pattern that helps create the password for all your sites. You can see the pattern we drew in the first image. 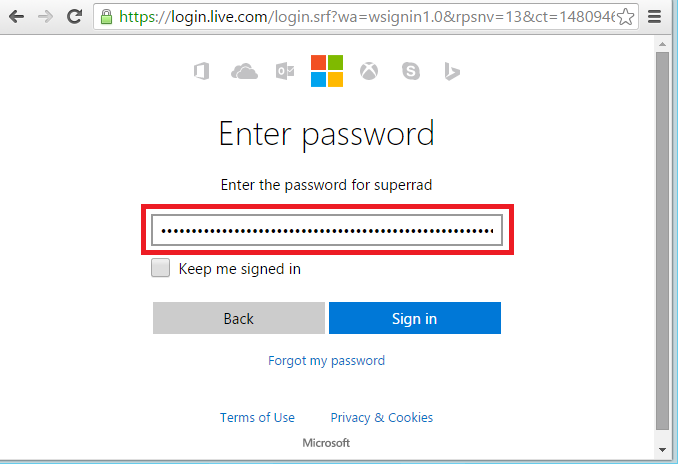 In this example, we'll sign into our mail account at Microsoft Live. 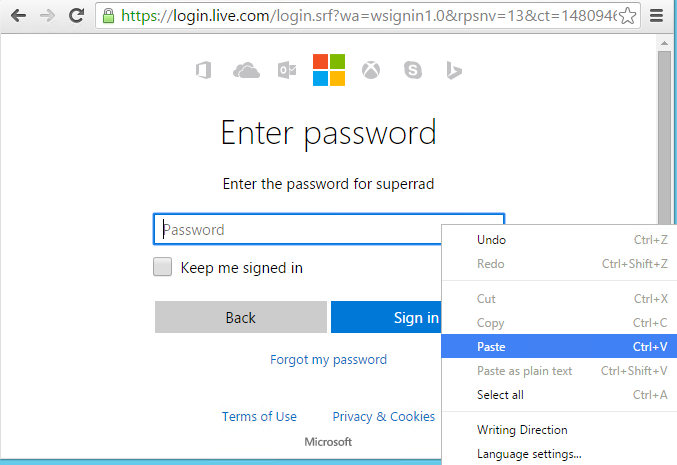 Just right-click on the password text box and choose the Paste item that appears in the context menu. I've highlighted the password field in the next image to make it stand out. You can see that the password box turns the characters into dots to hide them. This isn't all that amazing, except of course you don't have to type your password. On a computer, that's not too big of a deal because you have a physical keyboard. However, imagine trying to type that 64 character password on a mobile device. With C'YaPass you never have to again. 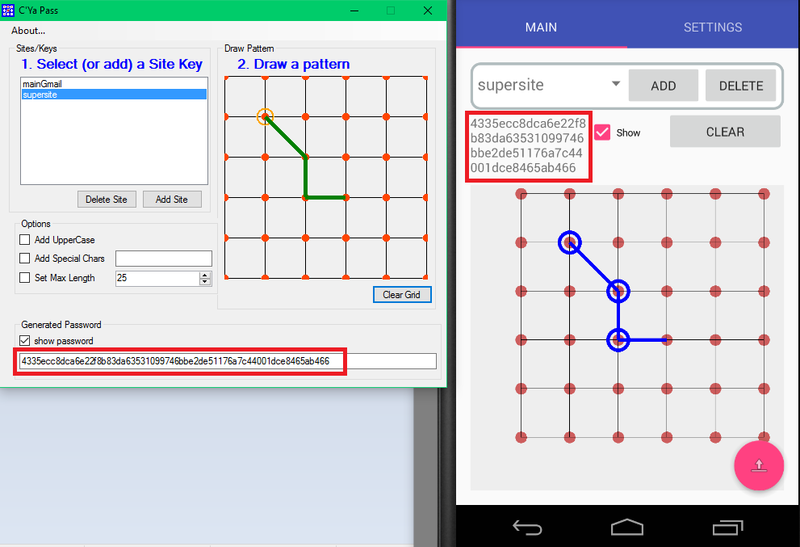 Let's take a look at the Android app as an example. We can do this fast, because it's the same thing. Take a close look at the generated password. 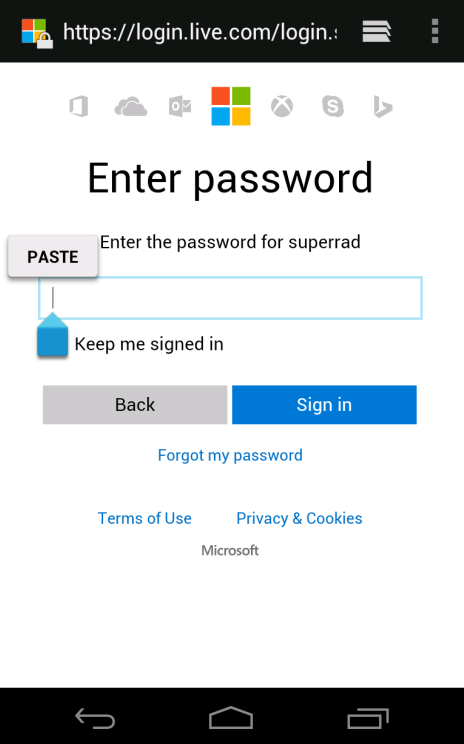 It's the same generated password here on Android as you had generated in the Windows app. If you had altered either of those you'd have a completely different complex password. Never type a password again. You will never make up a password again. We've all experienced it. You go to a web site and try to sign up and create a password and it has yet another set of arbitrary rules for creating your password. Those requirements are often created by developers who make arbitrary decisions that are not based upon current research. MIT Technology Review magazine has exposed research which shows that longer passwords are stronger. Making passwords stronger means making them longer. But everyone knows that human memory has limits. A great length for a password might be 64 characters. However, there are few people who are going to memorize a 64 character password for even one site. That's what C'YaPass is for. It generates long passwords (which are not based upon words) and will manage them for you. The alarming thing in these requirements is that a password is constrained to a maximum of fifteen characters. That's not good. That's a very short password and makes it quite a bit easier for hackers to generate password possibilities. These requirements confuse users into believing this is how you create a strong password. But, as the MIT article mentioned, the hackers have changed their methods and using those extra symbols doesn't do much to increase the strength of a password. Yahoo! mail - They changed this right after they were hacked. Previously they only allowed passwords up to 32 characters. My AppleId will only accept up to 32 characters and it forces an uppercase. We've all seen those Password Strength testers which supposedly determine how strong your password is, but they are of dubious value. That's because they simply check for things like the arbitrary requirements I showed you earlier in this article. When I enter a 64 character hash value generated by C'YaPass, that is not based upon words into those things, they generally say the password is of medium strength. That's something that really needs to change. 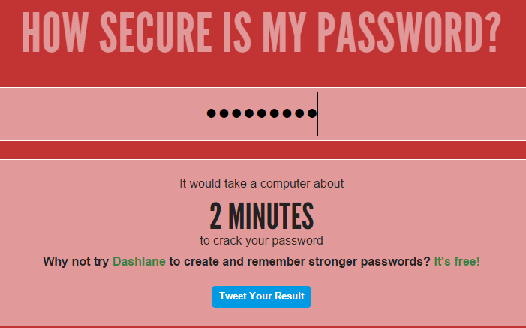 Here's a utility that was created by the creators of DashLane, a popular password management system that stores your passwords in an encrypted file or out on the web on the Dashlane site. That link will open in a new window and then you can check your password strength and how long it will take hackers to guess your password on average. Yes, sesvigintillion is a real number.That's a long, long time. See https://en.wikipedia.org/wiki/Names_of_large_numbers for more about sesvigintillion. Whether you decide to use Dashlane or C'YaPass is up to you, but definitely start using something to make your passwords stronger and your accounts more secure. The iOS / iPhone/ iPad version is coming soon (by end of year 2016). Why Did I Create C'YaPass? Who Will Use It? Passwords have become such a burden that many people escape them however they can. Recently, my son began attending the local University. I had to sign up for numerous new IDs during that time (a FAFSA fed id, another University ID tied to my son's, etc). I was lamenting the problem of multiple IDs and passwords when my son's friend said, "You know what i do?" Then without waiting she finished. "I just use one password for all of my accounts." My jaw fell open and I said, "You are going to get hacked." "Oh, I did. My Facebook account got hacked. You know what I did? I just changed one letter in my password to an uppercase or something. It's just too much of a pain to think about all those passwords." If you're tech savvy your first thought may be that someone who feels this way may not be intelligent. I assure you this is a very smart person. She's an honors student at University. This type of thinking may be naive, because the person believes it doesn't even matter if they do get hacked, but this is not about intelligence. It's more about how annoying and overburdening passwords have become. It's perfect for kids who are probably going to take shortcuts to creating passwords. Get them to use it and help them have one more layer of security for their online accounts. 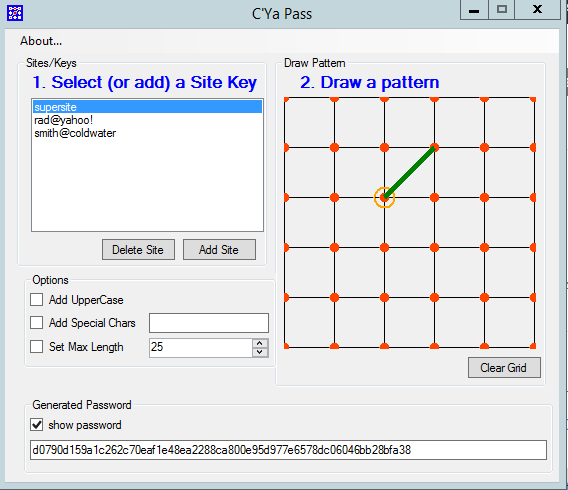 You may be a technical savvy person who finds it easy to create cryptic passwords. But most people are not great at it. Help those people use C'YaPass. You may have the ability to memorize thirty different passwords to thirty different accounts but most people just take the path of least resistance. Those are the people that should be using C'YaPass. You may understand that there are real security issues and real hackers who can cause real problems if they get your information. A lot of people just don't even consider the problem, because passwords are first and foremost a burden. Those are the people I want to reach. I want to give them any extra help to create the most secure accounts that I can. I created C'YaPass to help everyone manage the overwhelming number of online accounts that most of us have now. 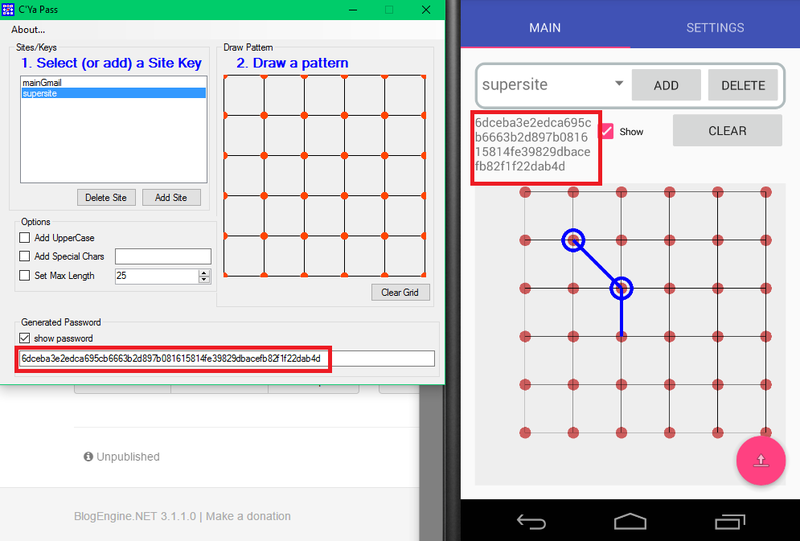 It's meant to be a simple tool that can be run universally (Windows, Android, soon-coming iOS (iphone / ipad). Get it and use it for free. I believe you'll find it serves to resolve a lot of the nonsense that is associated with the modern difficulty of password management. If you can memorize your password, it is because it is most likely based upon a mnemonic (memory device). If your password is based upon a memory device, it is most likely based upon a natural language (English, Spanish, etc.) word. Humans tend to memorize based upon words since it is how we communicate. However, if your password is based upon a word it is weak. But, why is that true? To understand the reason that word-based passwords are weak, we must take a look at the methods that hackers use to crack passwords. It's a little more difficult than this because most sites do not store their passwords in clear text but instead they also hash those passwords. You can think of a hash as a one-way encryption technique. That means the computer algorithm takes an input and will turn that exact input into one and only one output. In our example above, we use the ClearText (unencrypted) input of the letter a.
I've made the Hash Algorithm (in this case we are using SHA256 - Secure Hashing Algorithm) a black box in the diagram because we do not need to know the implementation details of how it works. Every time we input the value a into the SHA256 algorithm we are guaranteed the output shown on the right. That value becomes a unique identifier for the value a. We can think of this as a one-way encryption. But why do we call it a one-way encryption? That's because it is unfeasible that anyone can reverse the process to turn the hash value (ca978112ca1bbdcafac231b39a23dc4da786eff8147c4e72b9807785afee48bb) back into the ClearText (the letter a in our case). Let me say that again. There is no known way to take the hash value and calculate what the original ClearText input was. That's the power of a secure hashing algorithm. Along with that, the hashing algorithm also guarantees that two different inputs will never produce the same hash output. Even if the value is only changed by 1 bit of data (1/8th of a an ASCII character as it is stored on a computer). This is how most modern sites now store your password. They create a hash from the ClearText password that you've given them. They then store that hash in their database along with your userId so they know which on it is associated with. This guarantees that no one can every reverse the hash and discover your password. If you've been following along you may have thought about how you could go about attempting to break this. 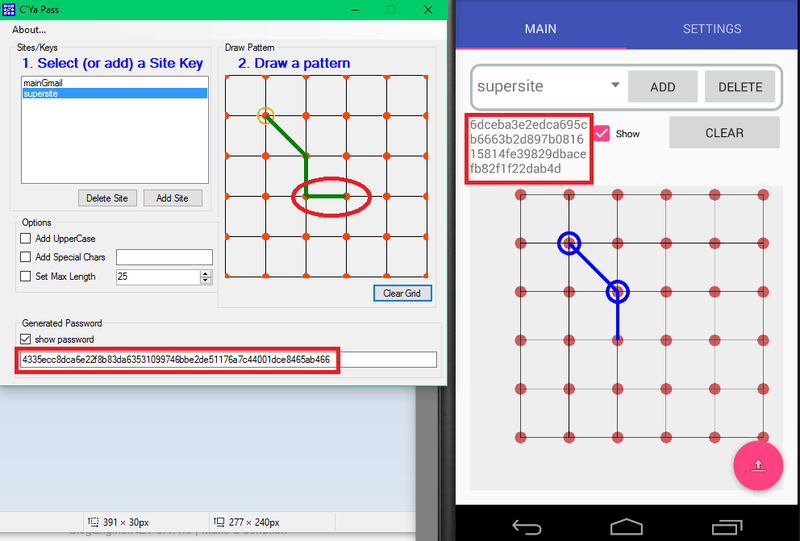 Since a specific ClearText message produces only one SHA256 hash, you could create hundreds of passwords, hash them and then compare those hashes to what is in the site's database of passwords. But this only works for weak and common passwords. That's exactly what the hackers do. They generate hashes from every word in the natural language dictionary. Let's look at an example table of how the hacker might do this (but of course you'll have to imagine that I have every word from the English dictionary available to me as the hackers do). This is also why using a password that is commonly known to hackers, like password1, is so dangerous. Modern computing power means that hackers can generate hashes for millions of possible passwords and compare each one of those hashes to their stolen password databases in very little time. Of course, with modern computing power, hackers are able to take multiple words from the dictionary, smash them together, and then compute a hash from those longer passwords too, since they are still based upon natural language words. They can do millions of these in a short period of time. Since the hackers know the scheme a lot of people use wh3r3 th3y r3p1ac3 c3rta1n l3tt3rs with numbers, the hackers generate millions of passwords that mimic that too. Once they mimic these patterns and generate the hashes they are bound to hit upon at least a few weak passwords out of the 500 million (according to Yahoo! that was the recent number) they've stolen. There is another element of security that is generally applied to this also called salting the hash that would further scramble the hash, but I won't go into that here. This exposes the fact that passwords based upon natural language words are much weaker since the attacker can use all the words in the dictionary to generate passwords, hash them and check them. 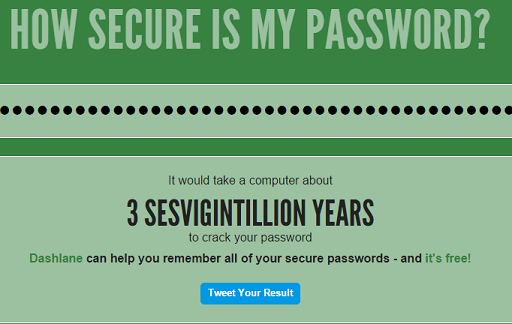 However, if you password were not based upon a word, it would be far less likely to be hacked. This leads us to the fact that you really should create your passwords from some random list of characters and numbers. The hacker is not even going to try that, because it would take her too long to even mess with creating an algorithm that checks an almost infinite list of hashes. There isn't enough computing power in the world to make this effective. That is why your passwords should themselves be based upon a cryptographically strong hash. That's what CYaPass does for you. How Could You Remember Your Password? It is unlikely that you could remember that hash above. Of course there are people who can do it But that would be more of a pain than just using the passwords you already use. That's why you should use C'Ya Pass and forget all your passwords. 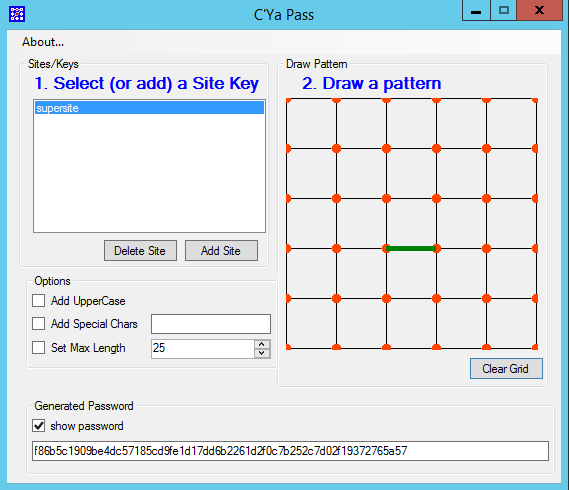 C'Ya Pass will generate a password for you that is a SHA256 Hash. That long password will be your actual password which will then (most likely) be hashed again by the target site you are logging into. Then, if the site you are logging into ever gets hacked it is unfeasible the hacker would be able to generate your original long hash password and be able to hack you. That's how C'Ya Pass makes your passwords stronger and makes it so you never have to memorize a password again.